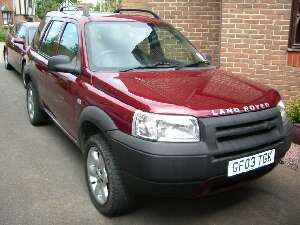 Description of car for sale : Land Rover 2003 O3 Freelander - 1.8 Kalahari 5dr Manual petrol Alveston Red £8,800 17,633 miles, "Excellent Condition - Like New. All Standard Kit - Ie Pt Leather Seats, All Round Electric - Windows, Folding Mirrors & Sunroof. 6 CD Charger. Recent MOT. Great Price."